Scranton's Houdini Museum RECENT ACQUISITIONS Page in the Scranton- Wilkes Barre / Steamtown National Park & Poconos Pennsylvania tourist area. We thank all who help make our mission possible. Those who donate will be put on this Page and get a beautiful certificate as well. It also takes quite a bit of money to operate this web site and the museum, so we also need your financial support. Thank you again. Donors and members get special privileges, access to secret unregistered web Pages we will be putting up, a beautiful certificate with Houdini's picture on it, and a new golden lapel pin that we are having made up, discounts, etc. Other specials as well. Thank you, you make the museum and web site available to the world. Please join as a donor or member now! 6 foot poster of Pulitzer Prize winning author Ken Silverman's biography of Houdini! This is a link to more information about this fine book. From publisher Harper Collins, NYC, USA. 2 copies of Red Magic, newspaper series Houdini and others wrote as a Sunday supplement. 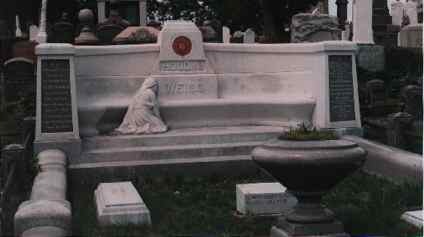 Wonderful series of 14 photos of Houdini's gravesite, with pictures of each individual stone and plot for each of the key members of the family. This is a link to more of this set of pictures. 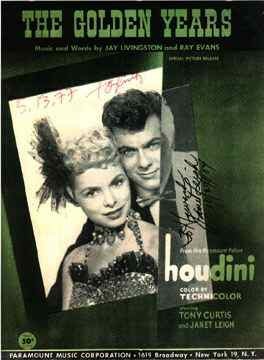 Anon-Color copy of sheet music autographed by Janet Leigh % Tony Curtis. Exclusive. The room in which Houdini Died! ONLY PHOTOS KNOWN TO EXIST. From Bob Franke,Jr, Texas, USA. Go to Houdini's beautiful posters, copies of which are available from the museum. Go to Some pictures of Houdini riding trains. Go to Laws in PA. protecting consumers from fraud by agents and bookers. Go to (links)local hotels, museums, more Houdini links, CityLink USA, etc.